Nic. Aluf, Porträt mit Dada-Kopf [Portrait with Dada-Head], 1920. Gelatin silver print. 21 x 16.7 cm. Aubette 200 (Gedrehte Deckenzeichnung für die Aubette-Bar), c1927. Watercolor and pencil on paper. 24.4 x 31.8 cm. Sophie Henriette Gertrude Taeuber-Arp (1889-1943) was a Swiss artist, painter, sculptor, textile designer, and dancer. 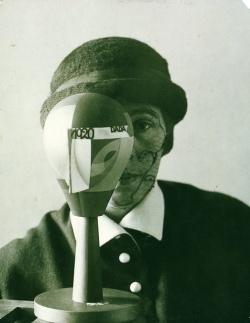 Sophie Henriette Gertrud Taeuber was born to a German father and Swiss mother and later became one of the only Swiss participants in Zurich Dada activities. Beginning in 1906, she studied decorative painting, drawing, and design at the School of Applied Arts of Saint Gall. She went to Munich in the fall of 1910, where she studied in the textile workshop of an experimental studio directed by Wilhelm von Debschitz. After a year at the School of Applied Arts in Hamburg, she returned again to Debschitz' studio until she moved to Zurich, where her sister had an apartment. In the fall of 1915 Taeuber met Hans Arp, an Alsatian artist and poet who would later become her husband. She and Arp embarked on an experiment with abstract forms. Taeuber's previous work with abstract geometric compositions in her designs for textiles formed the foundation of their collaborative duo-collages, which were composed of cut paper arranged in strict horizontal and vertical patterns. 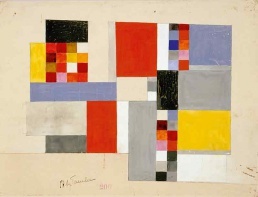 Taeuber also produced weavings from her own and Arp's designs and was in this respect one of the first artists in Zurich Dada to demonstrate the contribution of the applied arts to the development of abstract art. Throughout her years of involvement with Dada, Taeuber was also a professor of textile design and techniques at the School of Applied Arts in Zurich. Since 1916 Taeuber had been studying dance with Rudolf Laban, a Swiss modern dancer and choreographer who advocated a radical form of expressive movement. In April of that year, Taeuber and Mary Wigman, a student of Laban's who would go on to become a prominent modern dancer, began performing at the Cabaret Voltaire dressed in costumes designed by other members of the Dada circle. Because the Zurich School of Applied Arts disapproved of their professors taking part in Dada activities, she danced under a pseudonym. This page was last modified on 11 February 2019, at 20:38.